$15 million of new pension debt each and every day over the last 15 years! That’s what our state government has dumped on the taxpayers of the Commonwealth, all the while falsely claiming to have had balanced budgets and making Pennsylvanians some of the highest taxed and most debt burdened citizens in America. No wonder the demographic projection for Pennsylvania’s future is dire. The new pension bill that passed the House on June 14th does nothing to stop the increasing pension debt and, frankly, is a joke, albeit a cruel one. Even if all the assumptions baked into this convoluted plan hold true (and none of them likely will), the total present value of taxpayers’ “savings” over the next 35 years is about $1 billion. Compare that to the present value of the unfunded liabilities of the state pension systems, which is $70 billion and grows $1 billion every ten weeks, and you get an idea of how unserious elected officials are at addressing the single worst financial calamity in the history of Pennsylvania. It is particularly disappointing that rank-and-file members were excluded from trying to improve the bill through the amendment process on the House floor. Using sleight-of-hand parliamentary maneuvers that would have impressed David Copperfield, and manipulating the requirement for actuarial analysis of all pension bills, House leadership shut out all meaningful reform. No House member even had a chance to look at the actuarial analysis for the stacked hybrid pension amendment before they voted on it. All other amendments were ruled out of order because the House wouldn’t wait two weeks (or two hours for that matter) to review legislation that will have a fiscal impact on the Commonwealth for more than 80 years. In 2001 and 2002, legislators expropriated for themselves and other public sector employees a $15 billion pension surplus that belonged to taxpayers. In 2003 and again in 2010, legislators voted to divert taxpayer dollars intended for pension funding to other line items in the budget. These acts would be called theft and misappropriation of funds if it weren’t for the folks writing the law. The upshot is that taxpayers, still shackled with paying for and indemnifying exceedingly costly public sector retirement plans, are also stuck with paying off $70 billion of pension debt. As private sector employees struggle to fund their own modest retirements, public sector employees are guaranteed the most generous retirement benefits anywhere. Who’s the master and who’s the servant in this relationship? Supporters say the new pension bill is a step in the right direction. Folks, if you are on a beach when a tsunami is about to hit and you take one tiny step away from the ocean, it’s not going to make any difference. It is past time for the incremental approach to fixing the financial house of our state pension systems. Supporters also say the bill will slow the deteriorating financial condition of the state pension systems. That’s not true, but even if it were, what difference would it make to drive off a cliff at 55 m.p.h. instead of 60 m.p.h.? The governor and supporters of the stacked hybrid plan will claim that bipartisanship is alive and well in Harrisburg. The sad fact is it always has been with respect to public sector pensions. The party of stupid and the party of evil always find a way to agree to do what is both stupid and evil. Taxpayers today and into the distant future will have a hard time appreciating this “spirit” of cooperation. Or, as growing numbers of citizens are already doing, they will just leave the state. Alex Rahn Wanner Associates And Their Clients — As the onion unpeels in Chester County answers are revealed to questions that have long puzzled those in the “my-burden-is-hard-please-don’t-add-to-it” constituency as to why with our crushing government debt incomprehensibly bizarre spending choices are made. For instance, giving millions in subsidies to rich horse owners. And this seemingly drunken spending happens just as often when Republican voters give political power to those who campaign against such things. Republicans controlled all branches of Pennsylvania government between 2011 and 2015. Why does Planned Parenthood still get money? Where is the desperately needed pension reform? Why do rich horse owners get millions from taxpayers? Well, as noted the answers are being revealed. Chester County remains a Republican stronghold and most of its voters can still be said to fall into the social conservative AND fiscal conservative categories. 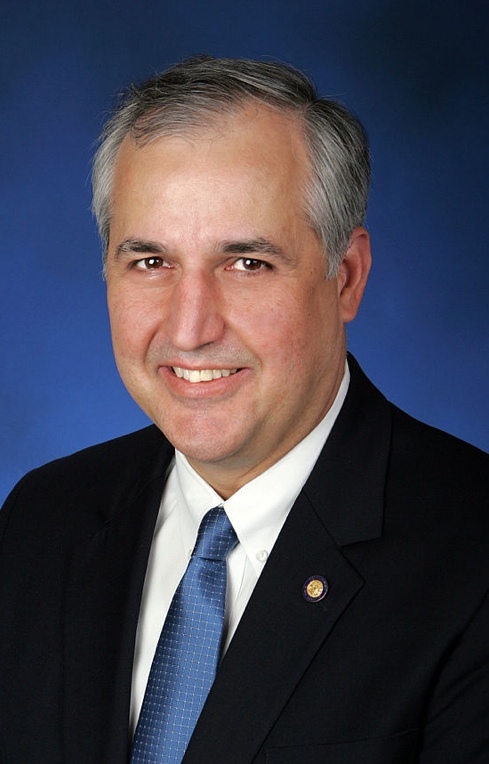 Val DiGiorgio, the man running the county GOP, however, as noted earlier, appears to have a close relationship with those running extreme-liberal Democrat stronghold Montgomery County. His right-hand man Alex Rahn, as also noted, has a wife who gives big to liberal Democrat causes. Now, some might argue that this is not Saudi Arabia and one can’t control what one’s wife does and they’d be right. Of course, that doesn’t mean they have to get her a county job either. But enough about spouses as that is just the gravy and not the meat. Val DiGiorgio’s client list. Click to enlarge. DiGiorgio is a registered lobbyist whose clients include well-loved and friendly Comcast and the Delaware River Waterfront Corp. started by Philadelphia Mayor Michael Nutter in 2009. Rahn is the Chesco GOP Area 1 chairman who is/was the reputed mastermind behind the purge attempt of Chesco committeepeople who don’t have their minds right. 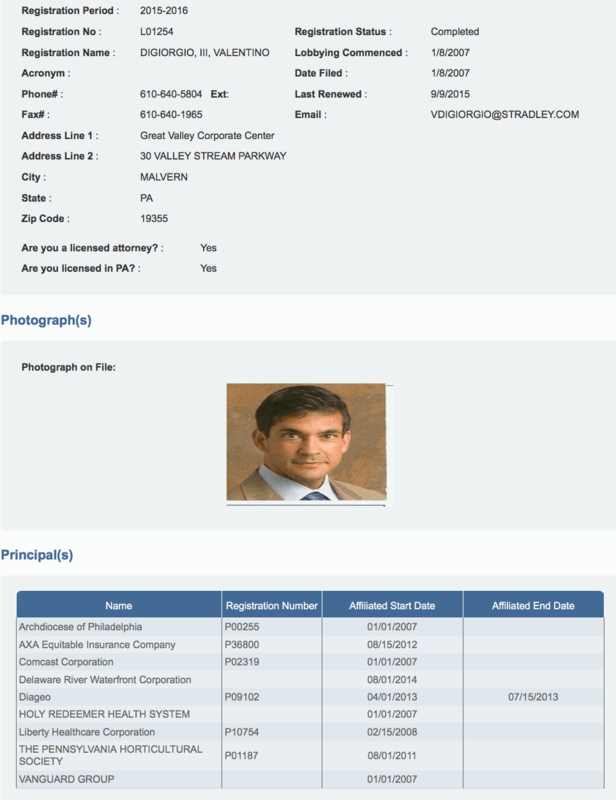 He is a senior associate/lobbyist with Wanner Associates, a major Harrisburg lobbying firm. 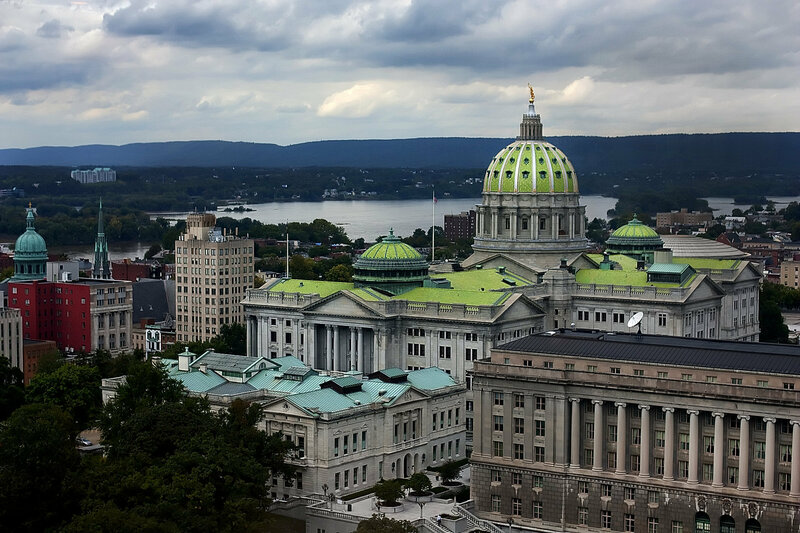 Their client list includes Standardbred Breeders Association of Pa., and the Philadelphia Federation of Teachers, a huge opponent of pension reform. Residents of Area 1, ask yourself does Rahn’s interests lie in making you happy or his clients? It’s a fair question. Residents of Chester County, ask yourself if Val DiGiorgio is more likely to address your concerns or those of Philadelphia or Comcast? And who is more likely to have their phone call taken seriously by a legislator, you or DiGiorgio? Now everybody, ask yourselves why the-powers-that-be always push for bonds and tax hikes to resolve fiscal problems rather than commonsense spending efficiency that might mean less income to the government-connected but more income for you? Paul Ryan Budget Cuts is an email that has been circulating since 2012 when the Wisconsin Congressman was the GOP’s vice presidential nominee. It explains how $2.5 trillion could be shaved off the federal budget over 10 years. The reasoning is based on H.R. 408 of 2011 and is basically correct. It should be noted though that Ryan, who is now Speaker of the House, was just a among the co-sponsors of the bill. It should further be noted that the National Debt is now at $18.8 trillion which is about $3 trillion more than when Obama was running for his second term and $7 trillion more than when he took office. Thank you American idiots everywhere for voting for this guy and for Democrats in general. And what happened H.R. 408? It died in the Subcommittee on Capital Markets and Government Sponsored Enterprises. Thank you backstabbing RINOs everywhere who figure your bread is buttered in Washington and not in your districts back home. * Eliminate duplicating education programs — H.R. 2274 (in last Congress), authored by Rep. McKeon , and eliminates 68 at a savings of $1.3 billion annually. *Manufacturing Extension Partnership (MEP) Program — $125 million annual savings..
* U.S. Agency for International Development — $1.39 billion annual savings. *Presidential Campaign Fund — $775 million savings over ten years. * No funding for federal office space acquisition — $864 million annual savings. *Require collection of unpaid taxes by federal employees — $1 billion total savings. * Prohibit taxpayer funded union activities by federal employees — $1.2 billion savings over ten years. *Eliminate death gratuity for Members of Congress. * Eliminate Mohair Subsidies — $1 million annual savings. *Eliminate taxpayer subsidies to the United Nations Intergovernmental Panel on Climate Change — $12.5 million annual savings. * Eliminate Market Access Program — $200 million annual savings. *Eliminate fund for Obamacare administrative costs — $900 million savings. 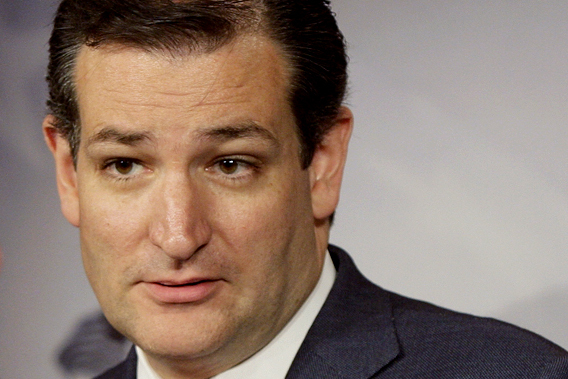 Ted Cruz is on a roll. At the Oct. 28 Republican candidates debate he exposed the establishment mouthpieces masquerading as journalists and the next day he exposes the GOP leadership as masquerading as people caring about the country. The senator from Texas coldly and calmly dissected the budget deal as cronyism that benefits all parties in power regardless of the letter after their name while crushing the working people who have to pay for it and especially their children. He noted the deal adds $85 billion in spending increases. He pointed out that the previous budget deal — that he had also opposed added just $63 billion over two years and was made when the Democrats were the majority party in the Senate unlike now. “Republican majorities have just given President Obama is a diamond-encrusted, glow-in-the-dark AmEx card,” Cruz said. “And it has a special feature. The president gets to spend it now, and they don’t even send him the bill. They send the bill to your kids . . .
And that my Republican friends is why the Republican Party leadership is in trouble. We cut you slack because we feel you are afraid of the press when you want stand up for common fiscal sense. We are now starting to get this real concern in the pit of our stomachs that it is because you don’t want to. The National Park Service’s National Center for Preservation Technology and Training tells us they have released $427,000 in grants. In a totally unrelated issue, former Penn State President Rodney Erickson is getting a public pension of $477,591 and former Penn State Vice President Gary “What Child Molestation?” Schultz is getting a public pension of $330,699. And our national debt is now $18.3 trillion. National Park Service Director Jonathan B. Jarvis announced, June 10, more than $3.1 million in grants to help preserve Civil War battlefields. The Land and Water Conservation Fund grants will preserve more than 270 acres of battlefields that are threatened with damage or destruction by development, he said. They include $78,531.50 to the Pennsylvania Historical and Museum Commission for 8.85 acres at Gettysburg. In related news, the Department of Treasury has announced that for the 90th straight day our national debt remains at $18,112,975,000,000. Remember way back in the summer of 2008 all those news stories about how our $9 trillion was a national scandal? Times sure do change. The claim recently made that Southeast Pennsylvania’s GOP backed Corbett’s pension revamp rings hollow. What the GOP fears is that Corbett is likely to be replaced by Tom Wolfe in the next election and some of them will go down with Corbett. Frankly, it will serve them right. If the GOP had truly supported revising the pension system for the teachers union and state employees they could have done it. But instead they frittered away the days with no solution in sight and none on the horizon. I think this indicates that these unions hold the GOP by the short hairs just as surely as they hold the Democrats. The victim from the legislators recalcitrance is of course the public and most notably senior citizens living on fixed incomes. To illustrate, Rose Tree Media school district in 2007 contributed $2.5 million to the teachers’ pension fund; this year 2014, the district is contributing $9.6 million, or an increase of $8.2 million – all taken from the pockets of already strapped taxpayers. In 2024 the contribution increases to $11.5 million. Please note that the amounts will be greater than these numbers because of the automatic increases in annual wages that teachers will receive over this time that increase the base on which the contributions are calculated. The typical pension paid to RTM’s retiring teachers approaches $100,000 a year. Many have pensions that far exceed that amount. The school district’s administrators receive even more with the average exceeding $150,000 a year and the superintendent is already scheduled to get $180,000 per year. Nobody in the private sector receives anything close to what the teachers’ union members get and yet the rest of us are forced to subsidize this scheme out of meager salaries and paltry retirement savings. Frankly, I think there is no hope Pennsylvania will ever resolve this problem simply because the legislators in Harrisburg are feasting on the same system. They can’t handle change. Mr. Evans is a member of Rose Tree Media Taxpayers United. Pennsylvania’s rating has been cut from Aa2 to Aa3 by Moody’s Investors Service reports PaIndpendent.com. Moody’s also cited Pennsylvania”s “large and growing pension liabilities”. The unfunded pension liabilities are expected to grow from $41 billion to $65 billion. The Pennsylvania legislature has shown a marked unwillingness to address the issue even in the most simplest terms. State Sen. Dominic Pileggi’s (R-9) bill freezing property taxes for homeowners over 65 years of age has been sitting around for a year but recently got some ink. The bill is SB 299 and illustrates perfectly why most who understand economics and government are not really fans of the Senate Majority Leader. Pennsylvania has a debt of $128.073 billion or about $10,000 per person of which $50 billion concerns its mismanaged pension systems. Freezing the tax for senior citizens would shift the inevitable pay-up to newlyweds, and people with kids in college and the unemployed of which there are 344,989. And of course, the small business owner whether he owns his shop or rents. The question we ask is why the fear to address the root causes, which are rather obvious. You do not need a constitutional amendment to repeal Act 195 of 1970 which granted public school teachers the right to strike giving the sociopathic types that gravitate to union leadership the legal right to threaten children for more money and power. Nor is a constitutional amendment needed to end the prevailing wage mandate that adds 20 percent to the cost of public projects. Nor should HB 1353, a bill that would change the pension plan for new public employees, be that difficult to pass. State Rep. Steve Barrar (R-166), by the way, has informed us that his vote against HB 1353 was because it did not go far enough. He is pushing for a full 401 (k) type plan and not a hybrid one that would still allow some direct benefits. He has a point. Why should public employees get direct benefits that most of us don’t other than Social Security for which none would begrudge the state workers from joining us in? Should we really have to lose our homes or see our rents jacked up to pay for these goodies? This link to a real time national debt clock comes courtesy of Cathy Craddock. When Democrats, and other big government types, say “think of the children” they don’t mean it for a $33,000 allotment of time — or about a second as per the clock.